SOUTH SIOUX CITY, NEBRASKA (March 25, 2014) - Sioux City Foundry Company will be featured on Manufacturing Marvels®, a nationally recognized series aired on Fox Business Network. 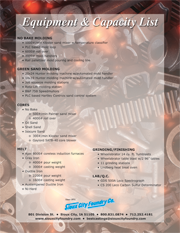 This two-minute segment will showcase Sioux City Foundry?s Metal Casting Division and is set to air Tuesday, April 15, 2014 between 8:30-8:45 pm (CST). "It?s a great opportunity to have our company featured on a nationally syndicated program." says Andy Galinsky, Sioux City Foundry Co. C.E.O. The program will spotlight Sioux City Foundry’?s commitment to quality and ability to pour various types of metal in a wide variety of shapes, sizes, and capacities. The segment will also highlight their value added services including heat-treat, machining, and painting, which make castings produced at Sioux City Foundry ready for assembly upon delivery to the customer. 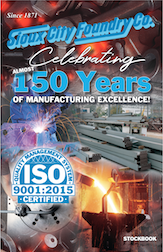 A family-owned company approaching 150 years of experience pouring gray and ductile iron castings, has made Sioux City Foundry the benchmark of excellence. 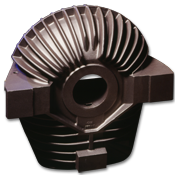 Located in the Midwest, Sioux City Foundry supplies castings to an ever-widening array of industries such as the oil and gas, military, pumping, mining, power generation, and agricultural industries throughout North America. Recognized for exceptional on-time delivery, short lead times, and quality castings, Sioux City Foundry provides award-winning customer service. For more information, visit www.siouxcityfoundry.com. Find your local cable and satellite providers' channel listing for Fox Business Network. Follow the link below and enter your zip code to see results for your area. Sioux City Foundry and stay up-to-date!